This is an attractive grill designed by Weber, sold under the Ducane name through specialty stores and made in China. 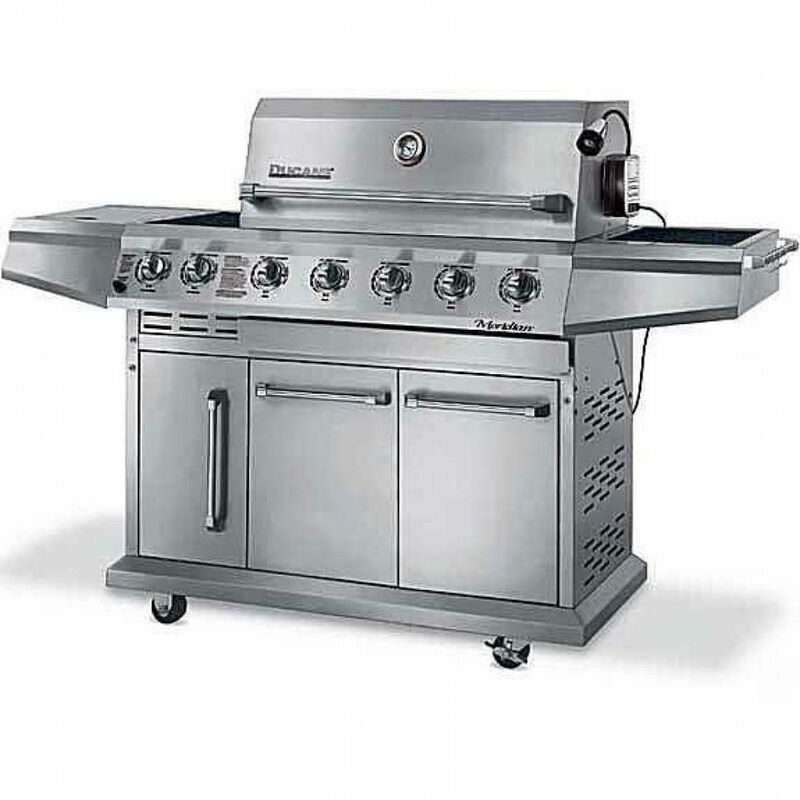 In the line of low priced complete stainless steel grills, this is a good unit. Built with good quality stainless steel and an efficient design this grill cooks well though I would say it was designed to look good before it was designed to grill. It does have a couple of good features and a whole host of extras. With a full rotisserie, side burner and good controls, you get everything with this grill, but the sacrifice for the price is the thickness of the metal and the long-term durability of the grill. This model line has been discontinued by Ducane. This is a full function gas grill that will do most anything you want. Made completely of 304 stainless steel this is one of the better all stainless steel gas grills on the market for under $2,000USD ($1,849USD MSRP). If it is important for you to have a shiny gas grill, then this is a unit to look at. This Ducane comes standard with a covered side burner, full rotisserie kit with a rear-mounted infrared burner, pull out drip pan, slide out propane tank rack and a thermometer in the hood. The five stainless steel burners put out 60,000 BTUs under 620 square inches of primary cooking space. It also looks very nice. Its greatest asset is the full 24/7 support and warranty provided by Weber. You shouldn't have any problems getting replacement parts for this unit, but make sure you've read the limited warranty. The downfall of this grill is the lack of weight in the components. The burners are low gauge stainless steel. The body and hood are thin, and the unit has loads of vents to let out heat so indirect grilling will be limited, and the unit will not hold heat for long after the burners are off. Because of the lightweight components, they may not last more than a few years before you need to replace them. The best component in the unit is the very heavy 5/16 inch rod stainless steel cooking grates. These should last a long time and give good grilling marks to your food.